The Queen is a wily old bird. She’s seen almost everything in her time, and she will have known that Gordon Brown’s recent visit to the United States did not result in the sort of unequivocal re-statement of the Special Relationship that we might all have hoped for. There was, of course, the small matter of the DVD collection, of the gaps in Obama’s administration that left British frustrations. She might have wondered, given her weekly meetings with the man, whether the Obamas were left underwhelmed by Gordon Brown’s warmth. The Special Relationship is far too important a matter to be left to the dour Brown. It is the Queen’s country, after all, and if your delegated man is not doing the job properly, wouldn’t you step in to put things right? So the Queen takes matters into her own hands, and clinches things in her own marvellous way. Commentators say that they can never remember a similar gesture being made by the Queen in the whole of her reign, in more than half a century. She simply is not known for making physical gestures of intimacy to her own children, let alone people she has just met. Has she just woken up to the power of touch? Sure, Michelle Obama is, without doubt, a wonderful, charismatic, educated, beautiful woman. But the Queen is still a wily old bird. There isn’t much doubt about the Special Relationship after this, is there? I mean, she didn’t exactly hug any of the other wives, did she? Nor can we imagine her cuddling Mme Sarkozy, even if the Duke of Edinburgh might have liked to. 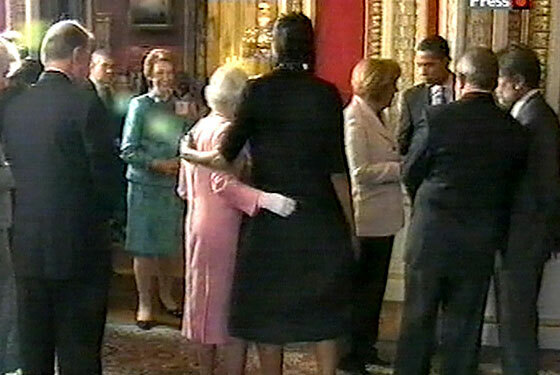 Look at the picture above, and you might be forgiven for thinking that Michelle Obama initiated the embrace. Watch the video below, and it looks as if the Queen set the tone. Beautifully. Sort of “Lean on me, girl, and I’ll show you the ropes”. And Michelle responded, and the deal was done. The Special Relationship looks good for another Presidency. Hi Margaret, Thank you for such illuminating point of view. Sometimes I wonder why we need a special relationship! Then again, I might be politically naive! You, politically naive? Never. Thank you for your many illuminating points of view! As for the special relationship – well, perhaps we just want to be on the side of the big guns and all the entente cordiale is purely realist. I think there’s more to it than that – I hope so, any way.